Those calling for the monument’s removal are “erasing history,” she said. She condemned the violence in Virginia and expressed sorrow for those killed and injured. On both sides? ON BOTH SIDES? Why didn't the LA Times reporters press this unnamed spokeswoman for the Daughters of the Confederacy to clarify what kind of hatred from the BLM movement she is referring to? 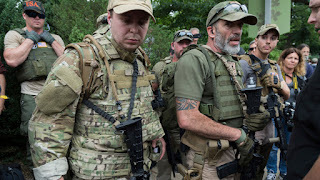 One side wants to celebrate the treasonous people who went to war for the right to enslave other people. All BLM wants is for the police to stop killing them. There is no both sides about this. There is no moral equivalence. There was a concerted social media effort to portray the BLM movement falsely. 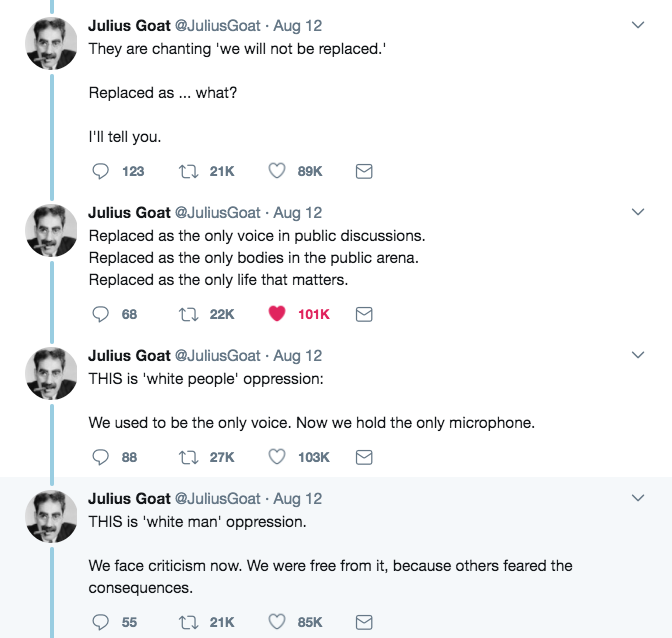 A great deal of money was spent to smear BLM so that they would lose public support.. Zeynep Tufekci ably explained how this was done in Twitter and Tear Gas. Read it! Learn more about the Russian propaganda tool, 'whataboutism,' that is widely used by authoritarians, climate deniers and the right around the world. I am so effing tired that we have to even fight the dark forces that are threatening our country right now. If you haven't already done so, I urge you to read Twitter and Teargas: The Power and Fragility of Networked Protest. Zeynep Tufekci has been studying the intersection of authoritarianism, technology and protest for decades and you really, really want to learn from her. An ad or two appears before the search results, as is typical for Google searches. But look carefully. 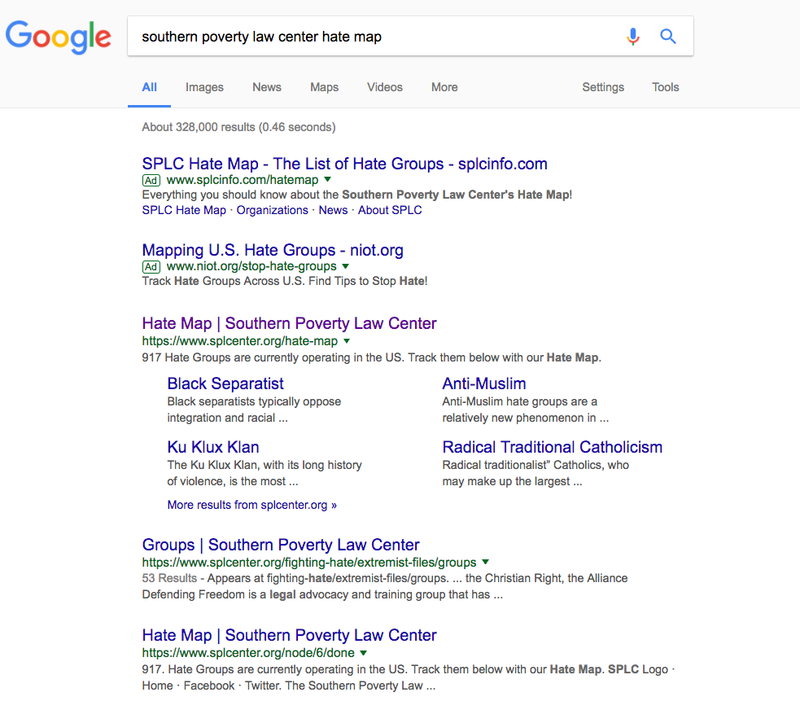 Notice that the top ad is for a website that exists solely to discredit the splc.org with completely fabricated lies? Who paid for that ad? How do they act so fast? There are literally armies of people working on spreading disinformation so that people give up and say that the fault lies with 'many sides.' Don't be that dumbf*ck. If you follow me on Twitter, you might have seen me tweet the screen capture to Google. 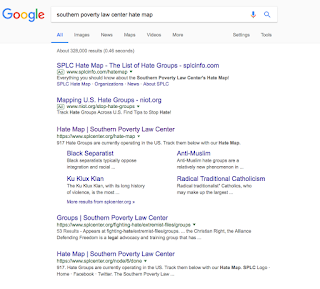 Enough people must have done it because searches for the same phrase and SPLC in general are devoid of ads and go to the organization's site and map. 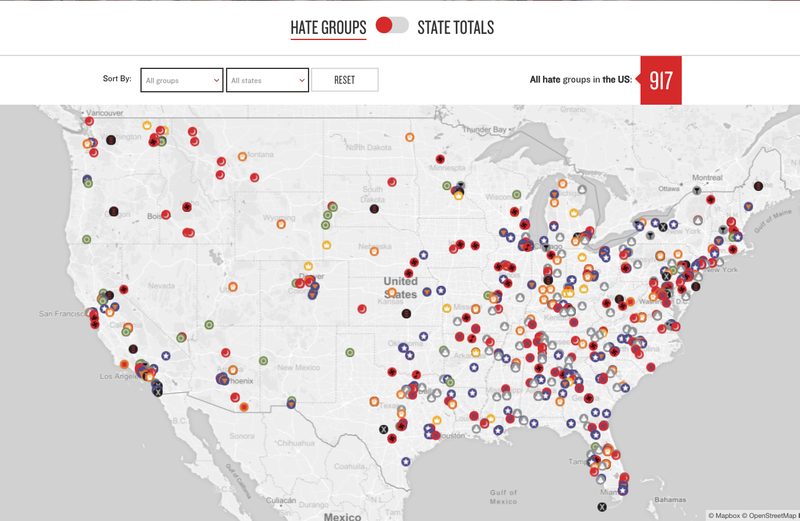 BTW, this is the SPLC Hate Map tonight. 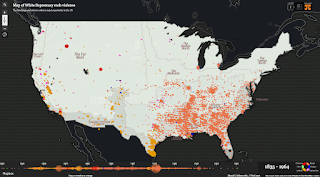 Less well-known, but deserves to be better known, is the Map of White Supremacy mob violence. The white militia is here to demand your obedience with their guns. Call me a feminazi, but I've never had to resort to carrying a gun to make you agree with me. 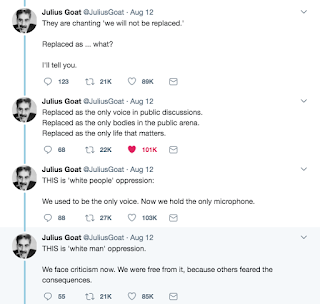 Why are white people so afraid? It turns out, white people who live among white people are at highest risk of being murdered or dying of illicit drugs. Mike Males crunched the numbers in an LAT opinion piece. I examined Centers for Disease Control statistics on murder, gun killings and illegal-drug overdoses among white Americans. Rates of homicides, gun killings and illicit-drug fatalities are highest in counties where nine in 10 residents are white and where President Trump won. Such counties are not limited to one geographical region. They include Boone County, W.V. ; Washington County, Utah; Baxter County, Ark. ; and Brown County, Ohio. Overall, white Americans who live in predominantly white and Trump-voting counties are 50% more likely to die from murder, gun violence and drug overdoses than whites who live in the most diverse and Democratic-voting counties. The more white and Republican a county is, the greater the risk for white Americans. Correspondingly, the white Americans who are safest from such deaths are those who live in racially diverse areas such as Los Angeles, New York and Chicago, where two-thirds of residents are nonwhite, where millions of immigrants live, and where voters favored Hillary Clinton in 2016. Nonwhites also are safer in these areas overall, though rates vary by location. The last sentence is at the crux of the BLM movement. If you examine the evidence, white on black crime due to irrational fear, is the bigger crime problem in this country. Trayvon Martin is not an isolated case. Stand your ground laws make it impossible to convict someone of murder if they claim that they felt that their life is in danger. If white people persist in irrationally believing that black people are dangerous, then they can legally get away with murder. This is the new lynching. It is the job of all of us to push back against irrational fear. Don't let people like Trump get away with spouting lies without pushing back. The lives of our fellow human beings depend on this.